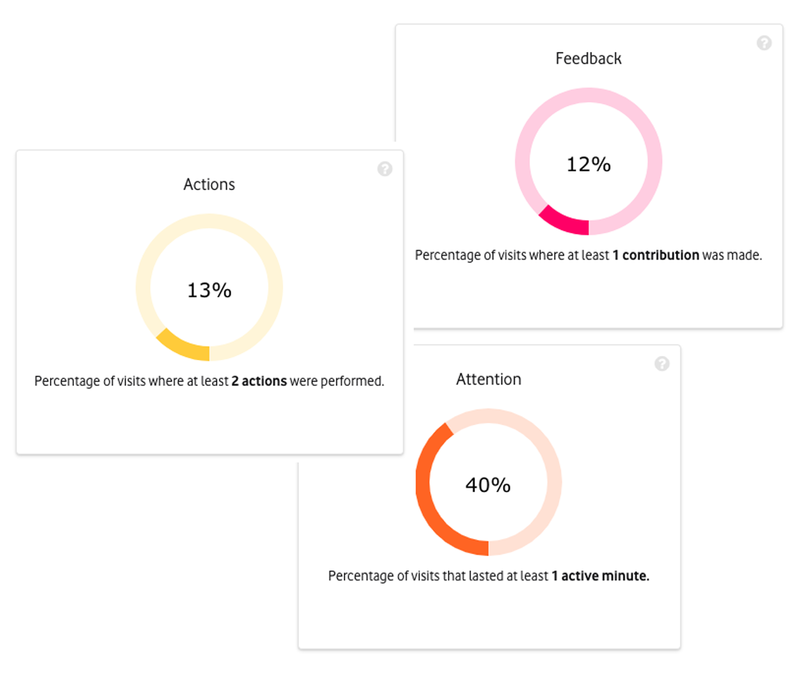 Track the performance of your engagements, understand what people are saying and how they are using your site. View key metrics about your engagement in stunning visual ways and see how these change over time. 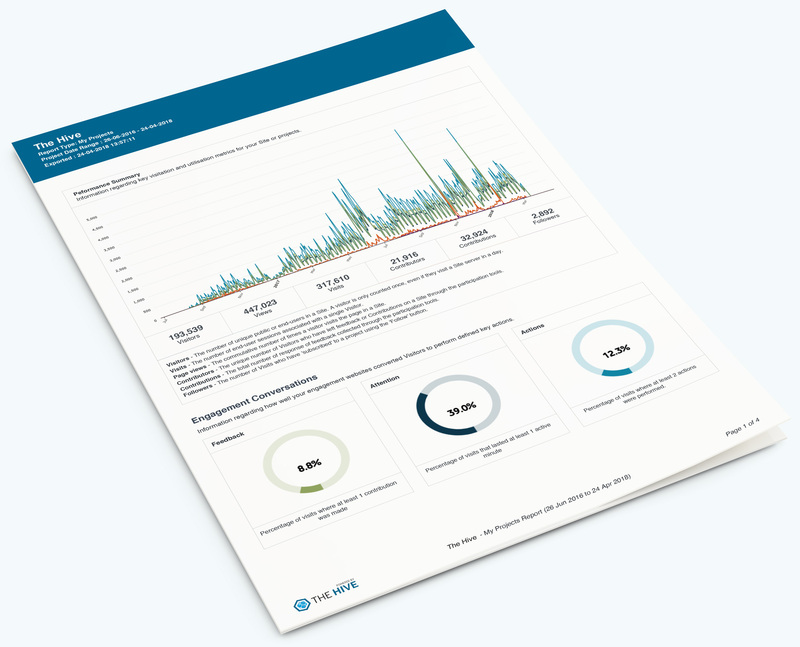 Export summary reports, or even individual graphs for inclusion into your reporting. View information as interactive, dynamic data visualisations to help you interpret patterns and trends. Filter data down to specific date ranges and levels to understand how activity and performance has tracked over time. Export reports as print-ready, high quality .pdfs to disseminate information within your organisation, or export raw data for further analysis. 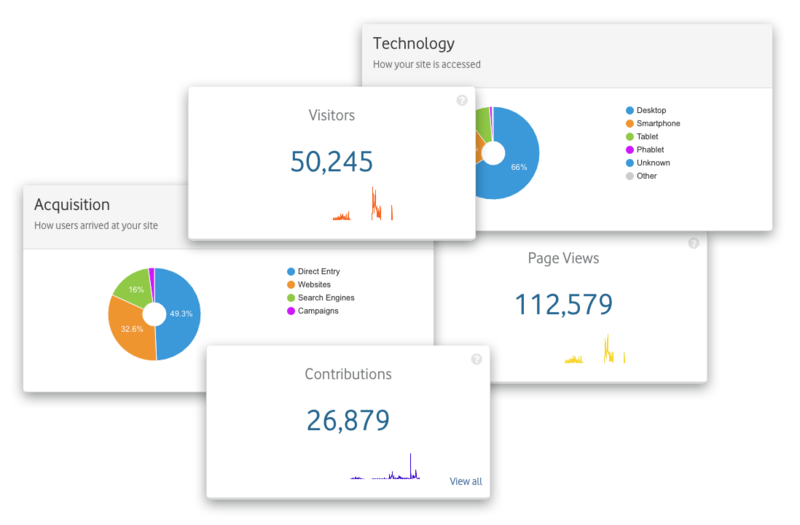 With reporting metrics designed specifically for public engagement purposes you'll be able to track how well you are converting your visitors against a number of key goals. Track what proportion of your visitors have actively participated by leaving contributions. Weed out 'bounced' visits to see how many of your visitors actually stayed on the site for more than one minute. Understand how many of your visitors engaged with your site by performing various click events like downloading files, opening videos or clicking links. Access reporting at various levels from a single project to aggregated groups of projects to better understand how your engagements are performing. Show all data and results at the level of a single project. Aggregate data from multiple but related projects to track the overall performance. View data on all team-based projects to see how an entire department or agency is performing over time. Understand activity and performance at the sitewide level across all projects and pages. 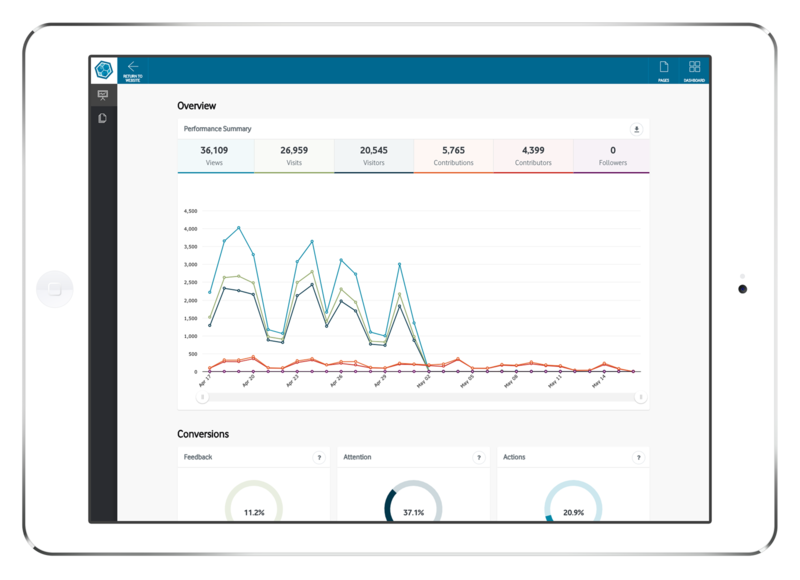 Reporting View key metrics about your engagement in stunning visual ways and see how these change over time. Filter activity by date range and report type and export summary reports in standard formats such as pdf, excel, csv or even individual graphs for inclusion into your reporting. Convert short-term visitors to long-term ‘members’. Customise your sign-up with a range of question types to collect a range of member information. Make it easy for your contributors to become members. Let your users sign-up through Facebook, and prompt registration following a contribution.